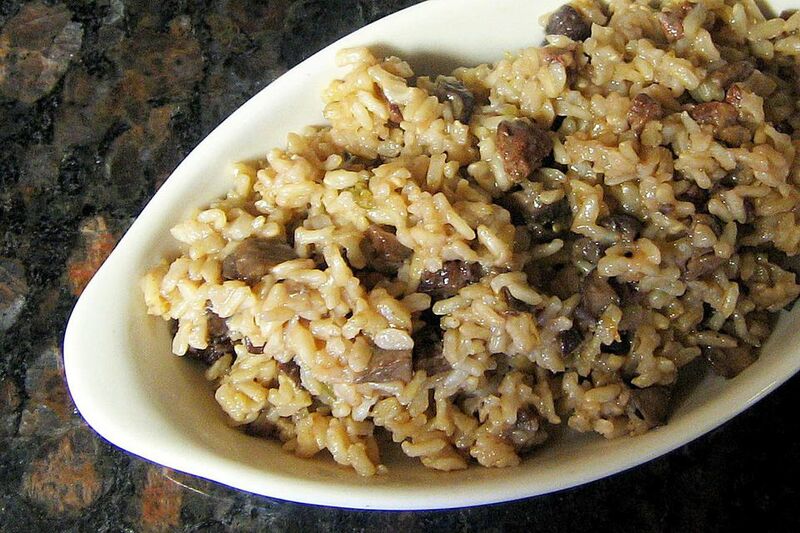 This delicious and aromatic brown rice pilaf is made with Basmati rice, chopped mushrooms, green onions, chicken broth, and toasted pecans, along with seasonings and optional dry white wine. In a medium saucepan over medium-low heat, heat the butter and olive oil. Add mushrooms and sauté until golden brown and tender, about 3 minutes. Add green onions and cook for 1 minute longer. Add brown rice and continue to cook, stirring, for about 3 minutes. Add chicken broth, salt, and thyme. Quickly bring to a boil. Reduce heat and simmer over low heat for about 45 to 55 minutes. Check and stir occasionally, adding the wine or more broth as needed. Add toasted pecans and freshly ground pepper. Stir and cook for another minute or two. To toast nuts, spread out in a single layer on a baking sheet. Toast in a 350 F oven, stirring occasionally, for about 8 to 12 minutes. Alternatively, toast in an ungreased skillet over medium heat, stirring, until golden brown and aromatic.